Top 10 Bajan Dub (Dancehall) Records for Beginners. Dancehall, which is referred to as Dub in Barbados, took root in Barbados in the early 1980s. The music became the music of the working class and the youth of the time. Eventually, some Barbadian artists produced their own Dancehall records and given the expense of recording at the time, they all did it the low budget way. The important difference with these artists and their Jamaican influences was that they all chose to produce melodic and lyrical content rich in Bajan dialect. In the last 2 years, there has been a resurgence of the form with a new generation of artists involved with Bajan dub. To help out those new to this, what I hope is an emerging form, I have compiled a Top 10 of the most influential/popular Bajan Dancehall/Dub tunes for beginners. Peter Ram was a chanter who came out in the late 1980s. He went on to become involved in Ragga Soca and the various Carnival scenes where he gained the majority of his popularity. However, this song from 1988 is how most in Barbados came to know him. The re-emergence of Bajan Dub Dancehall owed much to the Dub, a low budget house/community party and YouTube. Young hungry artists went to various communities to perform as well as putting their music on YouTube, skipping the traditional media. Crimeson embodies this perfectly, and his ‘hit, “Don’t Ask Me,” did much to throw the form back into the public spaces again. Another of the 2nd brigade of Bajan Dub artists is Fari. This song with its partial ode to Kelloggs, actually had no Froot Loops on the shelves of local supermarkets for a bit in Barbados. By the way, his lyrics are really commands to females to perform dances. He is not speaking about motorsports. Kid Site was not only a Bajan dub pioneer but a calypso artist of some merit. He later went on to win the National Calypso Monarch competition at Crop Over. His roots, however, are also planted in Bajan Dub and Reggae. His song Minibus, gives a humorous and fairly accurate portrayal of the private transportation taxis which to this day are responsible for the transmission of Dub and Dancehall from Jamaica and Barbados. Here you can hear the obvious Jamaican influence with much of Site’s inflections and phrasing coming straight from Jamaican Dancehall. I included this song, “Meat Gaw Pull” because it is what Dancehall is about to me: honesty and humour. Whether you agree with this honesty or not is another story. Another one here from the old school. This is influenced once again from Jamaica and the at the time ubiquitous “Sleng Teng Riddim.” Ricky, however, maintains more of the Bajan phonology. The song, like Site’s, speaks to the public transportation in Barbados. To complete the public transportation set, here is Ninja Man’s song from the early days of the Bajan Dub. Here we can hear the riddim being similar to the Jamaican Jammy rhythms. To end, I will give the premier, in my opinion, Bajan Dub lyricists. 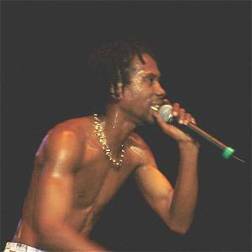 Lil Rick started firmly in Dancehall and went on to start a strand of Soca, Bashment Soca, through his highly influential, “Hard Wine” composition. Rick, before this, did some of the most popular Bajan dub song ever*. *Rick o, of course, nt on to do what can be considered Bajan Dub in his biggest song to date “Guh Dung”. *Special mention must go to Lil Rick’s “Talk for Me” and “ABC” two other hugely popular Bajan Dub songs. They would have been included but in order to give a wider cross section of artists they were excluded from the main list.